I have been a resident of Somersett since 2003 and have been very active in the community. I believe Somersett is the finest golf community in Northern Nevada and will strive to keep it that way. Since 2003 I have sold over 400 homes in the Somersett area. Most recently I was recognized by Nevada Business magazine as one of the top Residential Realtors in the State of Nevada, click here for the article. I use the most up to date marketing and technical advances that are available to get your home sold. 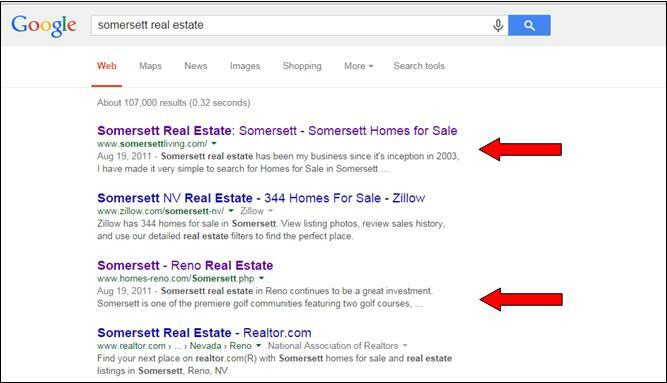 I have one of the top performing Real Estate Websites in Northern Nevada and continue to stay at the top of all of the search engines when doing a search for Homes for Sale in the Somersett Area. Below is more information about me. Feel free to give me a call and set up an interview on marketing your home, my cell is 775-771-1783 or fill out the form at the bottom of this page. Dave is the #1 Realtor at Dickson Realty which is the #1 Real Estate Company in Reno. One of the top 1000 Realtors in the country as reported by Real Trends magazine. Very Well Taken Care Of In The Vue, Easy To Show And A Very Good Value. Slab Granite In The Kitchen Along With Stainless Steel Appliances, This Unit Is Also Very Private. This Home Was Sold Before Put On The Market. When searching for Somersett Real Estate, David's two top websites are #1 and #3 alongside Zillow and Realtor.com. Wouldn't you want your house on the top websites when selling your home? Listing information last updated on April 18th, 2019 at 8:26am PDT.